Due to the rising awareness of healthy eating, researchers lay constant emphasizes on the importance of consuming olives and olive products due to their nutritive contents. The olive tree is historically known for its nutritional and medicinal values especially in countries such as Australia, the United States, Canada, Europe and Japan and these values are not limited to olive leaf extracts which have been, and are still being used for preservation and health promotions. The Olive botanically known as Olea europaea L. is a small tree of the Oleaceae family with origin from the warm temperate and tropical parts of the globe. The olive tree produces a popular fruit, known as olive which is economically vital especially in the Mediterranean region as a primary source of olive oil. Basically, olive oil is produced by mechanical or direct pressing of olive fruits under mild thermal conditions that do not alter the olive oil composition. Olive fruits are oval in shape, measuring 2–3 cm in size inclusive of the length and width and also comprises of 3 parts; endocarp (stone), epicarp (skin) and mesocarp (pulp). The epicarp is covered with wax, the endocarp contains the seed while the seeds contain oil. 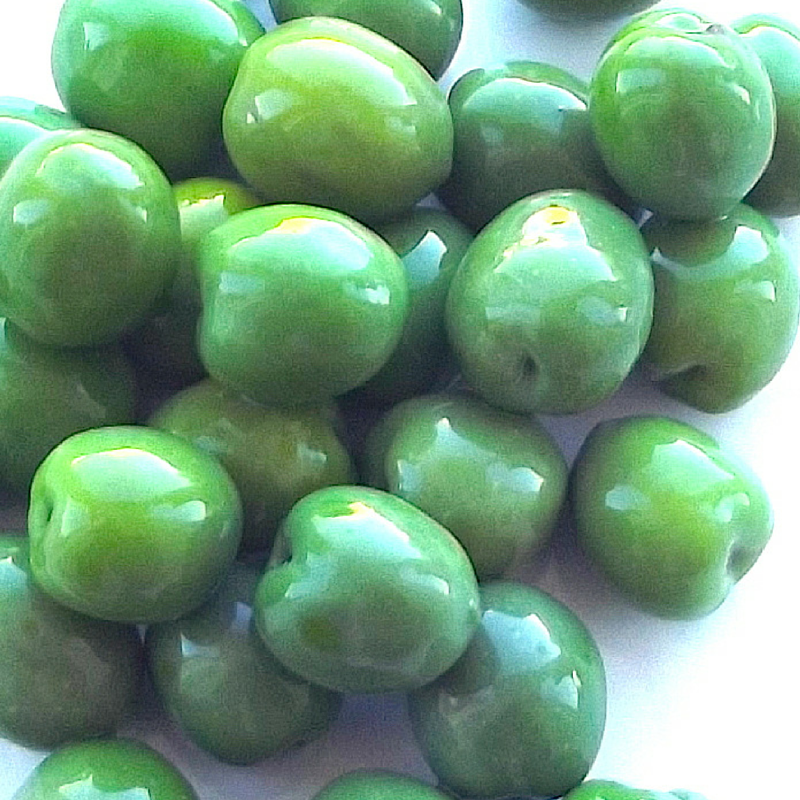 During the growing stage of olives, the skin changes colour from light green colour to purple and then brown or black. It takes olive fruit approximately 5 months to grow and mature under suitable climatic conditions however, growth tends to be slow during winter season. Olive fruit is composed of 1.6% protein, 1–3% phenolic compounds, 5.8% cellulose, 19.1% carbohydrate, 50% water, 22% oil and 1.5% inorganic substances. The health benefits of olives and olive oil are mainly as a result of the presence of high content of phospholipids, functional bioactives, phenolics, tocopherols, carotenoids as well as monounsaturated fatty acid (MUFAs). These properties add up to the characteristic taste and flavour of olives and olive oil. Olive is an excellent source of vitamin A, E, K, calcium, potassium, iron, dietary fiber, amino acids and magnesium. Researchers agree that olives and olive oil contain anti-cancer, anti-oxidant, anti-obesity, anti-diabetic, anti-hypertensive, anti-microbial, anti-inflammatory and anti-thrombotic in nature. Adopting Mediterranean dietary lifestyle which incorporates daily intake of olives and olive oil has been supported to have a beneficial impact on human health. Olives and olive oil are known to be healthily beneficial to human beings and being part of the Mediterranean diet, has made many researchers to pick interest in this fruit. Olives and olive oil contains 80% of monounsaturated fats and 20% of polyunsaturated fats which makes them a healthy substitute for fatty oil and saturated fats such as butter thus highly recommended. A health condition caused as a result of the accumulation of excess body fat which has a detrimental impact on the human health with tendency to cause a reduced life expectancy is referred to as obesity. Obesity is a medical condition often caused as a result of excessive intake of medications, starchy food, endocrine disorders, lack of exercise and genetic conditions. Researchers recommend that obese individuals should rely more on dieting and exercising for a healthy body and the best approach is to reduce the intake of food products which are high in sugars and fat and by increasing the consumption of dietary fiber such as olives. Studies reveal that olive oil has been very beneficial in dealing with cardiovascular diseases which is a major cause of death all over the world. 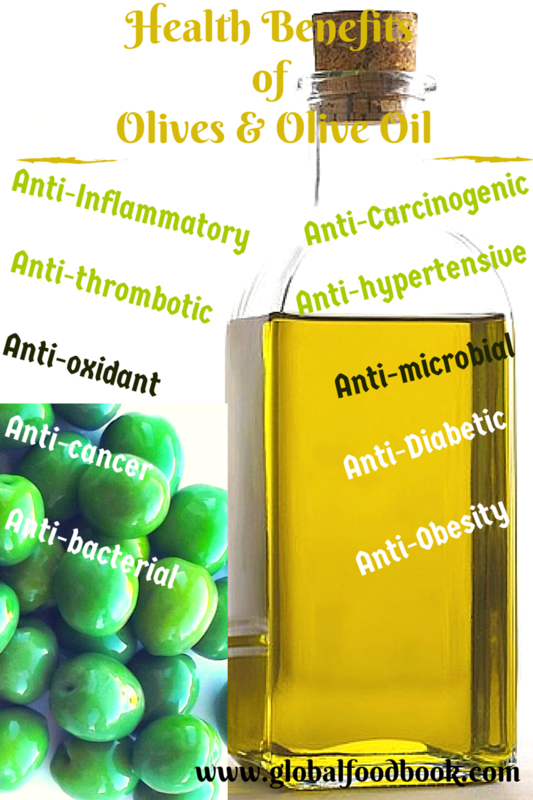 Researchers attributed these protective effect of olive oil on cardiovascular to oleic acid and antioxidant polyphenols. Olive oil is very beneficial in improving the risk factors associated with cardiovascular disease as well as plays a great role in the reduction of bad cholesterol (lipoprotein) and the increment of good cholesterol. Olive oil is also beneficial for improving antithrombotic conditions, blood pressure and glucose metabolism. Studies confirm a reduced incidence of hypertension in individuals eating olives and olive oil and this type of intake has a direct impact on the diastolic and systolic blood pressure. Olives and olive oil are highly effective in reducing heart diseases more that medications by reversing the atherosclerosis present in the carotid arteries. Obesity and overweight are serious health risk factors that can be managed by lifestyle changes and diet. Researchers agree that Type II diabetes which is the most common type of diabetes can be easily controlled and preventable if properly managed. To a larger extent, olives and olive oil has a higher positive impact on type II diabetes comparable to low fat diets. Olive oil affects type 2 diabetes and other metabolic syndrome by facilitating weight maintenance and weight loss. The presence of oleic acid in olives prompts satisfaction thereby encouraging food intake reduction. The oil content concurrently promotes maximum vegetables intake which are very nutritive to the human health. Maintaining a healthy digestive system is so vital for preventing chronic diseases as well as for maintaining a healthy body. History has it that olives and olive oil have been used in the treatment of diverse digestive disorders. Olive oil helps in digestion for easy absorption of nutrients and vitamins by the body. These benefits are attributed to the antimicrobial and antibacterial properties of olive oil which are needed for maintaining a healthy gut. Studies reveal that olive oil compounds have an impact on the antibacterial activities of Helicobacter pylori, including those resistant to antibiotic medication. Studies on stroke prevention agree that regular use of olive oil greatly reduces the risk of stroke. According to NHS UK, “Olive oil staves off stroke in the elderly”. Olive oil is a vital part of the Mediterranean diet, which is connected with health benefits such as lower risk of heart disease and reduced stroke risk. But, several factors lower the risk of having a stroke, including a healthy balanced diet with low levels of salt and saturated fat, and regular exercise. Adding lots of olive oil to your diet while ignoring these other factors is unlikely to bring benefits. Researchers support that dietary intake of hydroxytyrosol and polyphenol compounds present in olives and olive oil protects the blood lipids from oxidative damage. At least a minimum of 5mg of hydroxytyrosol and other related polyphenol compounds must be present in the food product to offer such protection over heart related problems. The human body naturally protects itself from certain infections, stress and illnesses through inflammation but, studies reveal that some certain types of illnesses cause the human body’s immune system to function abnormally thereby leading to chronic inflammation which can cause chronic diseases and excess oxidation. Researchers agree that chronic inflammation is the major cause of serious illnesses such as diabetes, metabolic syndrome, cancer, neurological disorders, obesity, cardiovascular disease and arthritis. Due to this reason, many people have, and are still adopting the anti-inflammatory dietary lifestyle for maintaining healthy body as well as for facilitating healthy aging. Introducing olives and olive oil in your dietary intake is a good approach for maintaining a healthy body. The presence of phenolic compounds such as oleocanthal in olives has been proved to possess a positive anti-inflammatory effects in the body. The oleocanthal acts as a therapeutic treatment against several chronic inflammatory diseases such as cancer and degenerative diseases. Researchers attribute cancer to metabolic syndrome, inflammation, overweight and excess body fat. Mediterranean pattern of exercise and diet is very helpful in protecting the body from cancer by facilitating the maintenance of a healthy body weight. To a larger extent, consuming the right amount of fruit, vegetables, olives and olive oil improves the human health as well as manages the body weight for a healthier you. Cancer is a killer disease associated with age-related diseases, with a growing aging population which is characterized by consuming lots of high fatty food products, red meat, grains, refined sugary food, processed meat and dairy foods etc. However, researchers support that an improvement of the dietary intake can prevent up to 1/3 of cancer issues. To this effect, certain types of cancer can be prevented or managed through increasing olive oil consumption. The presence of oleic acid in olives has been supported to be highly beneficial in fighting against prostate , breast and colon cancer cells. The presence of high content of squalene and phenolic compounds in olive oil are very effective in fighting HER-2-positive cancer cells which are less responsive to treatment as well as more aggressive than other kinds of breast cancer cells. Unlike most food products, olive oil contains up to 0.7% of squalene which is of a very high level unlike many other food products that contain between 0.002 and 0.003% hence, highly recommended for a healthy body. Aguilera M., Gabriel B., Domingo O., Antonia F., Marino U. A. J. (2005), Characterisation of Virgin Olive Oil of Italian Olive Cultivar, Frantino and Leccino, grown in, Andalusia, Food chemistry. 89: pp. 389-390. Berbert A.A. et. al., (2005), Supplementation of fish oil and olive oil in patients with rheumatoid arthritis. Nutrition, 21: pp. 132-134. Cicerale S., Lucas L. J. and Keast R. S. J. (2014), Oleocanthal: A Naturally Occurring Anti-Inflammatory Agent in Virgin Olive Oil, School of Exercise and Nutrition Sciences, Centre for Physical Activity and Nutrition, p.359. Esmaeili A., Shaykhmoradi F., Naseri R. (2012), Comparison of oil content and fatty acid Composition of Native Olive Genotypes in Different Region of Liam, Iran, International Journal of Agriculture and Crop Sciences, Vol., 4 (8), pp. 434-435. Ghanbari R., Anwar F., Alkharfy K. M., Gilani A. H., and Saari N. (2012), Valuable Nutrients and Functional Bioactives in Different Parts of Olive (Olea europaea L.)—A Review, International Journal of Molecular Sciences, pp.3296-3300. Hashim Y. Z. et. al., (2008), Inhibitory effects of olive oil on invasion in human colon adenocarcinoma cells in vitro, International Journal of Cancer, (122), pp.497-498. NHS UK (2011), Study finds olive oil 'lowers stroke risk. Salas-Savado J. et. al., (2011), Reduction in the Incidence of Type 2 Diabetes With the Mediterranean Diet, Results of the PREDIMED-Reus Nutrition Intervention Randomized Trial, Diabetes Care, (34), pp.15-17.